A little over a year ago, I posted a review of one of my family's favorite Asian restaurants, Dynamite Sushi. 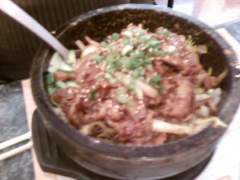 In that review, I mentioned one of my favorite dishes, a "Hot Stone Bowl" dinner item, whose Korean name is "Bibimbap." It was at Dynamite Sushi that I first encountered this wonderful dish, although I have had it elsewhere (Shira Kiku, formerly Goong Choun on Broad Street, in Nashua). Yesterday, with Chardonnay home for the Halloween weekend from college, we visited Dynamite Sushi once again, and I ordered the Bibimbap with spicy pork as the meat. The fuzzy picture accompanying this article was my meal after it was delivered, taken by Chardonnay's cell phone. Due to the use of a stone bowl (heated in the oven), this is not a dish I can easily make at home, so it remains a dish that I tend to eat occasionally as I am able to encounter it. My research indicates that Bibimbap (which has several variations in spelling) is considered a Korean national dish. It can be prepared many different ways, with the constant being rice with the variations being the julienned vegetables and mushrooms, thinly sliced meat or chicken, and even a fried egg. The bowl is heated (the "hot stone bowl," of course! ), and presented with the rice on the bottom, with the fried egg on top of the rice, with the vegetables and mushrooms next, then meat, with any garnish on top of that. In typical Asian style, the presentation of this dish segregates the vegetables and mushrooms layer into "pie wedges" that result in a very pleasing splash of color. Bibimbap can be made with many different kinds of meat or chicken, and Bulgoki (thin slices of marinaded steak) is a popular choice. If you haven't tried this dish, I heartily recommend it.